NPA MD CHARGES PROFESSIONAL WOMEN ON EFFECTIVE PERFORMANCE. 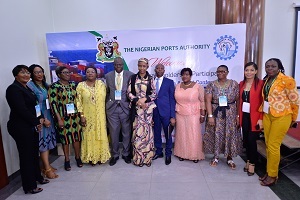 The Managing Director of Nigerian Ports Authority, Hadiza Bala Usman has yet again charged women professionals in the Maritime sub-sector to invest more in themselves in order to be indispensable in their field of endeavors. Hadiza Bala Usman gave this charge in a key note address at the opening session of the annual conference of Network for Professional Women in the Maritime and Port sector of West and Central Africa (PMAWCA) at the Oriental Hotel in Lagos today. The Managing Director, NPA Hadiza Bala Usman, to her immediate right, Chairman (NPA) Board of Directors, Emmanuel Olajide Adesoye, to her immediate left. Secretary General (PMAWCA-AGPAOC) Michael A. Luguje and a stakeholder during the PMAWCA Women Network annual conference in Lagos today. The Managing Director pointed out that the Maritime and Port activities in the sub-region is beset with myriad of challenges ranging from decay in infrastructure to low capacity utilization, corruption, insecurity and other inefficiencies and enjoined women in the sector to initiate actions that will turn these situation for the better in the sector and to the benefit of the sub region. While asking for increased opportunities for women in the sector, she declared; ‘Women sure need to have more opportunities in the sector given that only 2% of the world’s Maritime workforce is made up of women, according to 2015 research by the International Transport Workers Federation”. 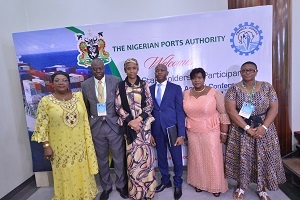 She called on delegates to fashion out ways in which women can collectively contribute to effect the much needed change in the maritime sub-sector and the nation in general. In their goodwill messages, the General Coordinator of Professional Women in Ports and Maritime Sector, Madam Adanlete Lawson and PMAWCA Secretary General, Mr. Michael Lueguje commended the Managing Director for her achievements so far and for the support she has given to PMAWCA over the years. The President of Nigerian Association of Chambers of Commerce, Industries and Agriculture (NACCIMA), Chief Mrs Alaba Lawson, who was represented by the Director General, Nigerian Chamber of Shipping, Mrs Obiageli Obi also delivered a goodwill message. The Network of Professional Women in Ports and Maritime sector is an affiliate of Port Management Association of West and Central Africa (PMAWCA) and the four day conference will feature discussions on successes and challenges of Port Concessioning, Change Leadership and management etc. The NPA Managing Director will also speak on Women in Executive Leadership- Challenges and Successes. Personal Experiences from West and Central Africa at the plenary session. Over 200 hundred delegates from West and Central African countries are participating in the conference.